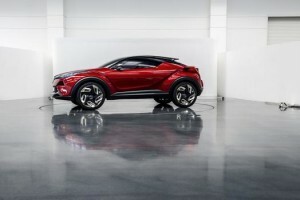 Scion unveiled the C-HR Concept last year, but recently, Toyota revealed that it will be folding the Scion vehicles into the existing Toyota model lineup as the Scion chapter comes to a close this August. This news left many wondering what will become of the current model, and Scion’s future concepts like the C-HR. Luckily, Toyota has stepped in and will simply rebadge the FR-S, iA, and iM to Toyota 86, Toyota Yaris iA, and Toyota Corolla iM, respectively.There’s nothing major to worry about, but with the switch to Toyota 86, the FR-S will be getting a mild refresh, which includes new front and rear fascias, LED lighting, improved performance, and an upgraded interior. The C-HR will join Toyota’s model lineup in 2018, and is set to go on sale in spring 2017. What is the Toyota C-HR? The Toyota C-HR earns its name from its Compact size and High Ride height, and with its unique styling, the C-HR is unlike any subcompact crossover you’ve ever seen. With a sharp exterior design, the C-HR will most likely slot in under the Toyota RAV4. The hatchback design will give owners more utility and functionality of the rear cargo area without sacrificing its sporty styling. The Toyota C-HR was designed for the “yuccies,” the young urban creatives who inspired its design. Boring design is replaced with eye-catching modern styling. The 2018 Toyota C-HR will be based on Toyota’s New Global Architecture (TNGA), which is designed to create a lower center of gravity, more responsive handling, improved ride quality, and increased body rigidity. Experience the joy of driving when you get behind the wheel of the Toyota C-HR in spring 2017. While there are no official specifications of the engine or transmission for the C-HR that’s headed to the US, we can speculate that a naturally-aspirated 2.0L four-cylinder engine will be found under the hood. Perhaps, Toyota will offer other engine options later on, but we won’t know until closer to its release. Follow Marina del Rey Toyota, and we’ll get you the most up-to-date information on Toyota news and local events. Visit our dealership in Marina del Rey, CA and come see our new vehicle inventory today! Contact us to learn more, or to schedule a test drive.